SymQuest Group, Inc., a wholly-owned subsidiary of Konica Minolta Business Solutions U.S.A., Inc., and regionally based IT services and office technology provider, contributed $11,000 in grants to New Hampshire area nonprofits as part of its One Grand of a Helping Hand for Upper Valley Nonprofits campaign. "It is a great privilege to have the ability to give back to the community," says SymQuest President, Meg Fleming. "Aligning the opening of our new office with an opportunity to support local organizations was important to our employees, and our culture. We recognize the value each deserving nonprofit organization brings to the region, and we want to be sure they can continue to support our neighbors." 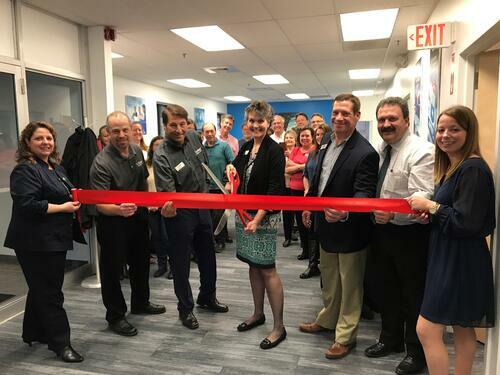 The grants were announced at SymQuest’s May 5th ribbon cutting for its new office located at 66 Benning St. in West Lebanon, NH. Nonprofit grant recipients included: David's House, Good Beginnings, Inc, Good Neighbor Health Clinics, Green Mountain Children's Center, Twin Pines Housing Trust, American Precision Museum, Developmental Services of Sullivan County (Pathways), Enfield Shaker Museum, LISTEN Community Services, Spark! Community Center, The Center for Cartoon Studies, Upper Valley Aquatic Center, Upper Valley Waldorf School, Vermont Adult Learning, Vermont Institute of Natural Science, WISE and Woodstock History Center. SymQuest’s new 4,400 Sq. Ft. location supports sales, service, and network operations personnel. The new office also houses a demonstration facility for office technology solutions including multi-function copiers and printers, production and wide format printers and cloud infrastructure solutions. To learn more about SymQuest’s commitment to the community visit www.SymQuest.com/Community.